Esther Schipper is pleased to announce the first solo exhibition of Ari Benjamin Meyers at the gallery. The artist and composer Ari Benjamin Meyers is interested in exploring modes of representation and presentation of music and musical structures in the context of visual art. 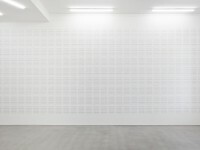 His conceptual projects and installations often expose the myriad inconspicuous yet tangible details of music-making: music scores themselves, forms and arrangements of musical instruments, concert settings, and gestures of performers and conductors. 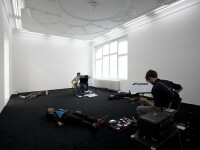 At the same time his compositions and performances seek to challenge and remold the relationship between performer and audience. In the exhibition "Black Thoughts" Ari Benjamin Meyers pays tribute to the composer Erik Satie (1866 - 1925), an influential figure of particular importance to the artist. Proposing a series of variations, re-enactments and repetitions the show challenges the concepts of originality and authenticity and questions the very idea of what constitutes a musical performance. Satie's composition Vexations (1893) is the departure point for the installation shown in the first room of the gallery. Taking up Satie's instruction to perform 840 repetitions of the one page-long piece, Ari Benjamin Meyers displays 840 hand-written copies of his own re-composition of the original titled Vexations 2. The grand piano (manufactured by Irmler and built in 1893) standing in the centre of the room has been manipulated to perform just one tone: A-flat (840 Hz), the single note that was left out of the main theme in the original composition by Satie. This seemingly simple intervention has required the piano to be completely rebuilt and restrung with custom-made strings. The second space of the gallery features a new composition "Serious Immobilities" written by Ari Benjamin Meyers. Composed for female voice, electric guitar and electric bass, the piece will be performed live every Saturday throughout the exhibition for the entire duration of the gallery’s opening hours. For the rest of the time the silent instruments and abandoned props become part of the exhibition display. The title "Serious Immobilities" hides a tongue-in-cheek reference to the instruction that Erik Satie wrote on the original "Vexations" score: "In order to play the theme 840 times in succession, it would be advisable to prepare oneself beforehand, and in the deepest silence, by serious immobilities." The exhibition reaches beyond the gallery space through a series of anonymous advertisements that concurrently appear in selected international art press and online portals. The printed phrases, for example, “Do you have black thoughts?” recall Erik Satie’s eccentric habit of publishing absurd announcements in the Parisian press of the time. 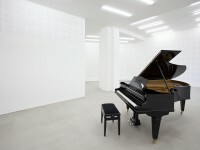 The recurrence here of the word "black" leads back to the image of the black grand piano standing in the gallery space and to the black lines and notes of the musical notation lining the walls of that same space.